Your abilities derive from his four steel tentacles. Attached to a harness encircling his lower chest and waist, each telepathically controlled, telescoping limb can move at speeds of up to 90 feet per second and strike with the force of a jackhammer. Also, you are able to generate a Gust of wind (as per spell) by spinning the prehensile extremities like a giant fan. At full extension, the mechanical appendages allow him to travel high above the ground as if on stilts. Using all four, he can achieve a maximum speed of about 50-mph. Each arm is about 5 inches in diameter and terminates in three single-jointed pincers. Each are attacks independently (so that if doc Oct gets 6/1 each arm get 6/1). The arms can get more then one attack of opportunity on a person. Also gives combat reflex. The arms have a reach of 1'-90' with a STR of a 30 (+10 to hit and damage). 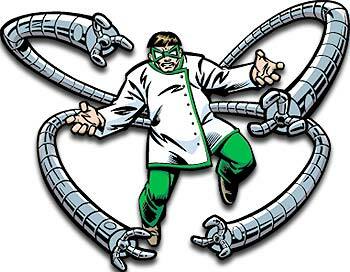 Each arm has 100 hp and a Dr of 20/+3. Can be repaired at the cost of 1gp per hp, 25hp/hour.